This baseball design is sure to please any baseball fan. 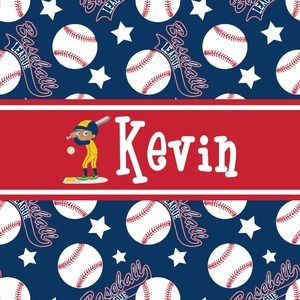 The background in classic blue, with baseballs, baseball league banner and stars in red & white make this a classic color scheme for any boy. We have chosen to customize it with a red ribbon and have added a baseball player with his name as the personalization. The uniform on the baseball can be customized to his team colors. You can also customize his hair, skin and eye color as well. <>We have many other baseball and sports related graphic in our system that you can choose from as well. With a few changes, this design can be easily adapted for teens and adults as well.